Animal Art: A current wave of artists are exploring internationalism and interspecies relationships in order to find ways of relating to the environment and to generate through art possibilities of communication with the natural world. Ideas of decolonialism used to unpick enlightenment theory are informing new pieces. Monika Tobel and Calum F. Kerr are both part of the extended group of underground artists based in London and beyond who have taken part in the creative extended exhibitions curated by Vanya Balogh in multiple venues including the London Q-Parks. Both use performance art approaches to investigate points of contact between homo sapiens and other animals. Calum F. Kerr has performed endurance pieces channeling creatures both mythical, transforming ideas of animals with personally crafted costumes. I have ridden on his back alongside the other visitors, often encouraged by his partner, the artist Miyuki Kasahara. Much of Kerr’s work is interactive and relies on participation from gallery visitors who he accosts and encourages to take part in the form of instant theatre. Since 2011 he has performed (although Kerr prefers ‘become’) the animal that corresponds to the specific Chinese New Year at the Chinese Open multi-artist shows. 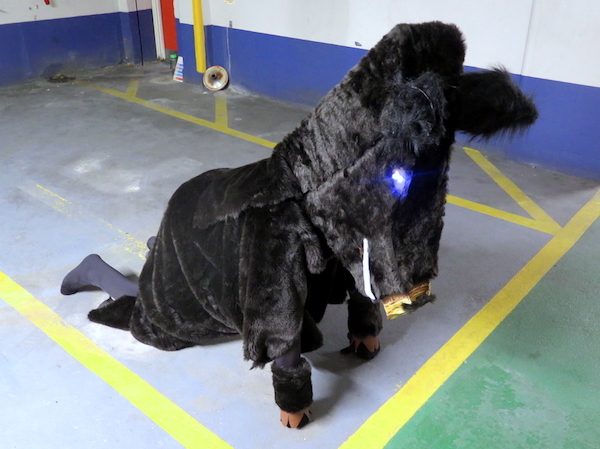 For the Year of the Pig multi-artist event, Kerr performed ‘(Beware) Wild Pig of Tomioka’ in which he became an interactive wild boar in a handmade costume of dark grey fake fur enhanced with blue-violet LEDs. This represented the radioactive area following the Fukushima Daiichi disaster in Japan in March 2011. We have just witnessed the anniversary of this incident which was marked by a protest which passed almost unnoticed in the current Brexit climate. Kerr brings social comment and concern for the condition of animals to his work, merging his animalistic performances with ideas from solid research as much as possible. The animals educate, almost like a presenter, lure the visitor into engaging with issues that threaten wildlife. In the case of the wild boar, Kerr chose to concentrate on Tomioka where the wild boar came down into the farms from the mountains and bred with domestic pigs. The population of boar then rose 300 percent to 13,000. When the government deemed the area safe for humans in 2017 the wild boar had less fear of humans and the authorities responded with a cull. In the performance. Miyuki Kasahara became the Dangerous Animal Control Officer, warning that the wild boar/pig may be contaminated with caesium-137. Another notable animal incarnation is Maurice the Dodo who voices extinction and loss including for ‘The News Agents’ on Resonance FM, London’s arts radio station. He was first created for the 46th anniversary of Mauritius’s independence from Great Britain on the Thames foreshore in 2014 at an artist-led event hosted in part by artist and writer Kiran Groodoyal, a London resident from Port Louis. Maurice is a bird that encapsulates elegy and exile. He wishes to return to Mauritius and is perpetually mournful. Monika Tobel’s performance and art respond to objects and drawings with interspecies narratives. In her many works with animals, she includes the physical presence of animals, either living or dead. In her piece ‘Farewell to Colonialism,’ she meditated on how colonialism interacts with collections, informing the displacement of non-human as well as human populations. Researching pinned butterflies in a picture frame, she discovered that they originated in SE Asia and this helped create her work about animals being misused and abused in conjunction with colonialism and the search for enlightenment. Tobel breaks down nature-culture divisions by devising original exercises to look at the environment anew, changing her perception of the environment, challenging conventional ideas of how to relate to the environment. Often these exercises are simple, including listening and interacting with multispecies collaborators. In one recent piece, ‘St Francis of Assisi and Me’ Tobel was remembering a drawing she had enjoyed as a child, where the friar preached to the birds. 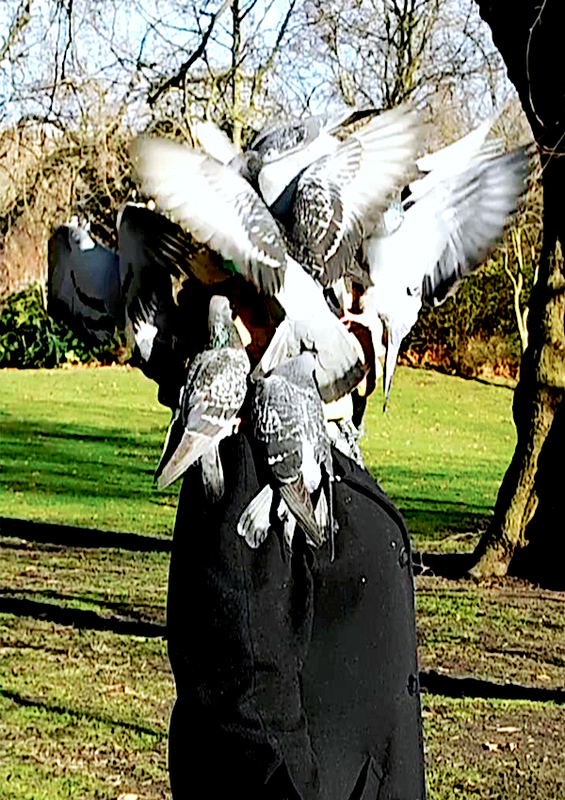 To develop a less hierarchical relationship with pigeons (who proved the most enthusiastic to take part) she developed a helmet which she wore walking through St James’s Park. Tobel sees this work as a collaborative performance where the birds of the air were contributing actors. Dennis Low uses photography to engage with multiple animals who like myself, is currently collaborating with animal rescuer Tracie Parsons in Blackheath in East London. This friendship is leading to a more personal engagement for Low with wildlife, injured and orphaned. And I am beginning to see a new body of work for Low emerging, not as yet exhibited. Previously he has investigated contemporary zoo photography and human interacting with animals. His photo essay ‘Take Me to the Kittens’ looks at interactions between human and cat in the markets and streets of Essaouira. Despite being apparently neglected, the cats draw in the human eye, whether it is Low’s photographing gaze, the child’s wide-eyed attraction or the cynical look of a man who may be ruthless in his regard. Low captures the way the cat makes its bed in the quiet spaces, finding the half-empty abandoned box in the sun, or chomps underneath a metal shop shutter on a mess of rejected tripe. Monika Tobel is a London based Hungarian multidisciplinary artist exploring nature-culture and species barriers. She is interested in breaking down these barriers, mainly by devising exercises that help her to de-learn and re-learn prescribed ideals of how to relate to the environment and its inhabitants, in order to develop a new non-hierarchical way of being in the world. She investigates modes of moral distinctions that enable us to commit atrocities against the signified other, be it race, gender, or species. Monika’s intrigued by the possibilities of non-lingual communication between different entities; the information exchange via scents, sounds, touch. Originally a painter, she has worked in a multitude of media throughout the years. Due to a conscious decision to stop making unnecessary objects she moved towards non-material processes such as video, performance and sound. Her practice mainly consists of simple exercises of listening and interacting with multispecies collaborators, realised in performance and video form alongside installations. Calum F. Kerr is an artist whose work involves performance, sculpture and sound. His artwork relates to place through inhabiting characters such as J. D. Swann (ornithological investigator), Brian Guest (founder of the Society for the Preservation of Admirable Rubble), a White Sperm Whale and Maurice the Dodo. He has exhibited and performed at numerous exhibitions in the UK and in Bulgaria, France, Germany, The Netherlands, Portugal, Spain and the USA. In 2016/17 he received an Arts Council England International Development award for research and travel to Japan for his project ‘Calum’s Road to Aonodomon’. Aural projects include ‘Flange Zoo’, ‘Lonesome Cowboys from Hell’, ‘Gran-paw Frankee & the Son-of-a-Gun’ and ‘I Am Dragonfly’.